Discussion in 'Installation/Configuration' started by laptop_user, Sep 30, 2011. 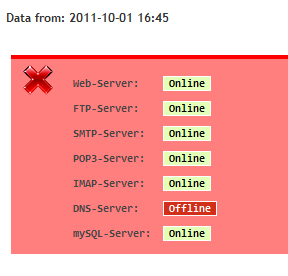 I has a vps and the server restart a few time. I dunno what happen but my provider says they are having problem with the node. OK now the problem is every service started automatically after reboot but bind9 failed to kicked in. So the node reboot a few time and thats also mean I had to ssh'd in to start bind9 manually. could not access PID file for bind9 ... failed! Is there anyway I could solve this problem? or maybe this problem is an isolated case? What are the error messages in your logs? Should I make any change if I want to set bind to run upon reboot. I thought it configures automatically like apache, mysql, ftp services? Thanks for your time falko. indeed it failed to start. Other services works fine though.